This could be a contest: what is going on here? 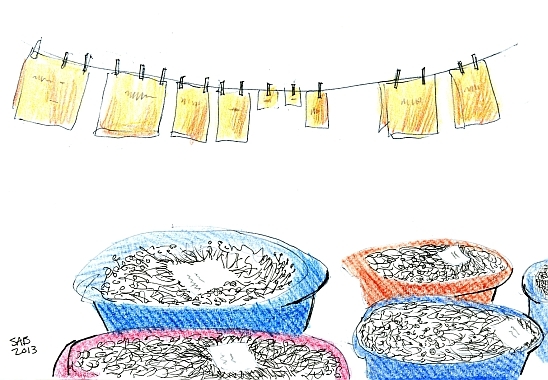 What is in the paper bags, and what fills the four plastic children’s swimming pools? The Prairie Enthusiasts of Southwestern Wisconsin are re-establishing some small areas of the native habitat of the prairies, as they were before European settlers arrived. The wading pools are collection containers for dried plants. The square white sheets of paper list the plants’ names. The bags store the seeds that are removed from the plants. For you gardeners, the seeds shown are: shooting star, prairie cinqefoil, wild quinine, and flowering spurge. Through controlled burns, the land is readied for replanting. On a scorching hot day, I (and my sister and her husband) rode in a wagon pulled by a tractor to view the restored prairies. It is quite a remarkable achievement. We took a ride out to the Hauge Log Church in Perry, Wisconsin during my last trip to the midwest. The log structure was constructed in 1852 by Norwegian pioneers. The southwestern corner of Wisconsin has a high population of people who descend from these transplants from Norway. At least the cold winters were not a shock. The logs are plastered over both on the outside and inside, so the visual effect isn’t quite as I had expected. The towns people work hard to maintain it, and many weddings take place here. 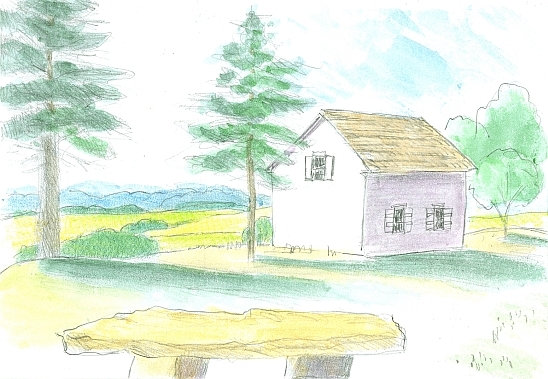 Visitors come for the serenity, simplicity, and the views over the rolling farmland. I think I captured the weather: a mist burning off to late summer warmth. 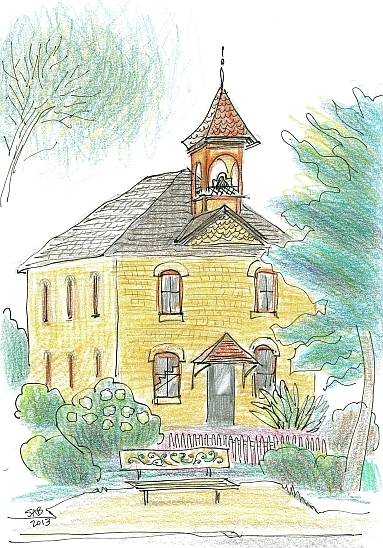 Anyway, one night at sundown I rushed out to draw the 1889 District #1 school house in Mount Horeb, Wisconsin. Amazingly enough, this rather substantial and heavy looking edifice was recently moved here from a few blocks down the street. On the bench, I carefully included the decorative folk art paint style called rosemaling. It is big in Norway, and here in Wisconsin too. 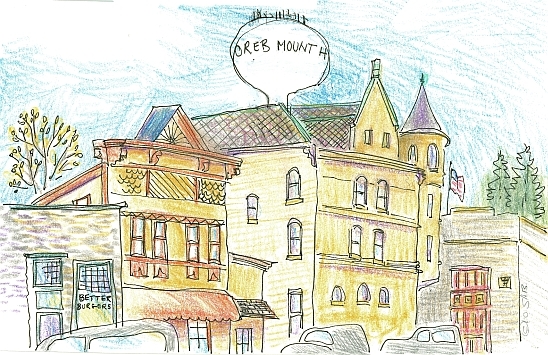 I have included an encore drawing of the main intersection of streets in downtown Mount Horeb, Wisconsin. The building with the leaning turret is the former opera house. Many of the buildings are constructed of local limestone. The building in the middle with the false front and ornate shingles is the town museum. 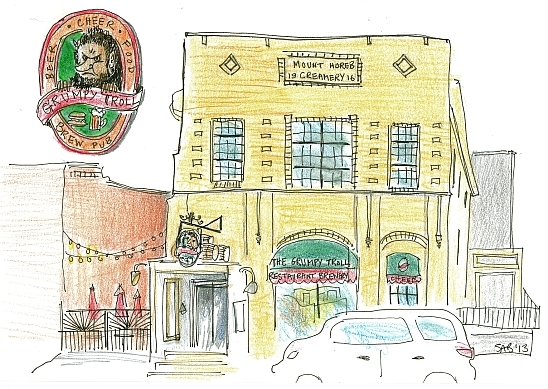 A major social center in Mount Horeb is the Grumpy Troll Brew Pub. (Ha, ha, I just mis-typed the word and it came out the ‘frumpy troll’. That too.) The yellow brick former creamery building is a brewery, pub, and restaurant. Mount Horeb is full of troll-themed places. All of the trolls sculptures that line Main Street are grumpy. That is the essence of trollery. I made that word up. Last week, we were in Baltimore, Maryland. Our airbnb rented apartment was about a six block walk from the famed Baltimore Museum of Art. I believe the scaffolding was going up as part of a cleaning project. The next day, a screening covered the entire front of the classic, marble building. The best part of drawing, really, is the seeing. I never noticed the two winged angels flying over the facade, each sharing a wreath. Their clothing and their wings were hard to make out from a distance, but I did love the flowing hair and their feet. Do angels really need feet? Our rented apartment in Baltimore was in Charles Village, a nice, walkable part of town near the Baltimore Museum of Art and the campus of Johns Hopkins University. As we stepped out the door of the basement apartment, this was the view from across the street. My favorite kind of elaborate brick rowhouses. The architects dreamed up a fantastic asymmetrical facade. The elements repeat throughout the block of about thirty units. And the whole street, St. Paul, goes downhill toward the harbor. Time for a few water images. 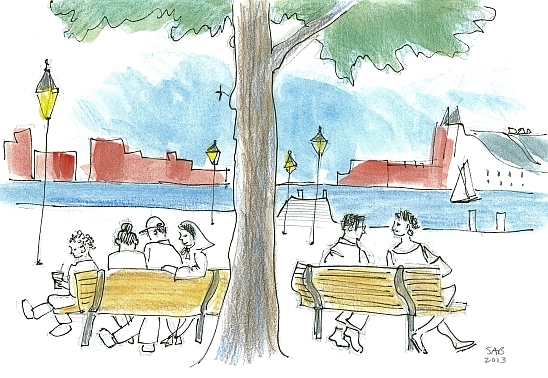 On a crisp fall day with a pleasant breeze I sketched the harbor in Annapolis, Maryland. 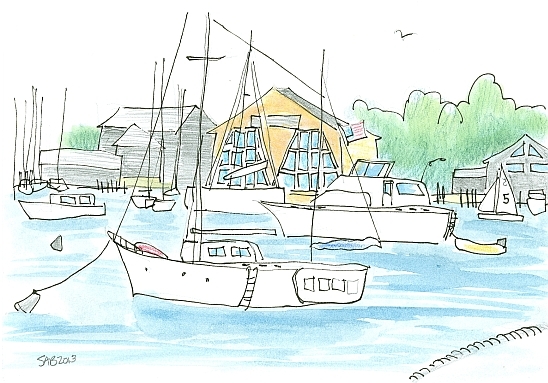 The boats were shifting all around as I drew them. That is the sort of thing you don’t notice unless you are attempting to draw them. The small numbered sailboat on the right was the only boat progressing through the waterway. Annapolis has a very active sailing education program, including school children. Sort of like driver’s ed. The newly shingled former boat house in the center is the Chart House Restaurant. Our younger daughter was married there in 2002. 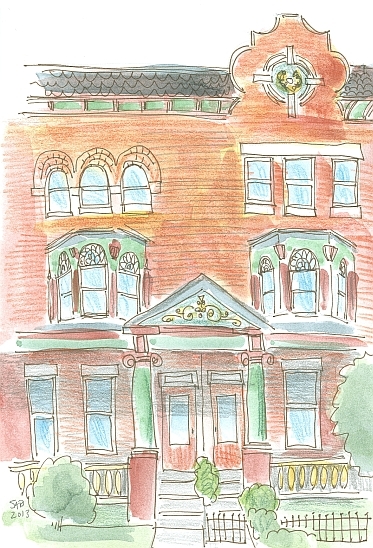 And a quick drawing of Fells Point in Baltimore. The large natural harbor is in the background. I bought some lemonade from a small stand just to the left of the scene. On the bench on the left, a family of recent arrivals enjoy the day. They were speaking Spanish to the lemonade seller. Baltimore has many immigrants from Central America. 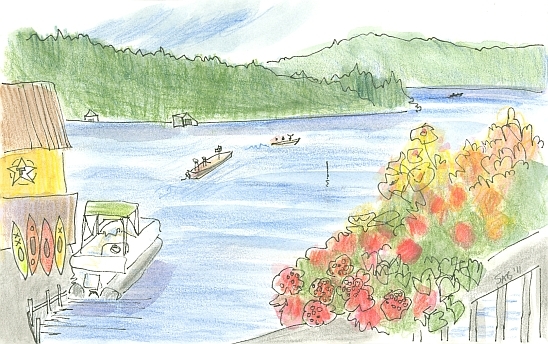 The local garden club in Holderness, New Hampshire has devised a way to beautify the bridge with flower boxes. Geraniums and snapdragons are part of the composition. 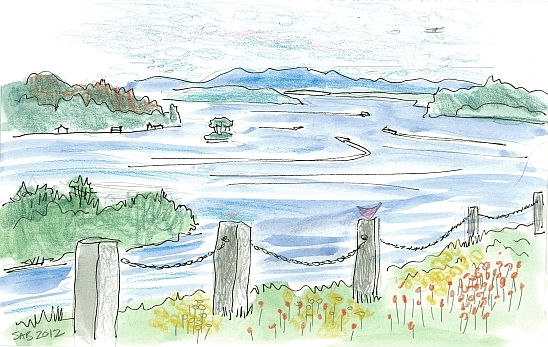 We are looking out over the bridge onto Little Squam Lake. The bass boats paraded out of sight and into secret fishing coves. The small town of Holderness (population under 2,200) is part agricultural, and part summer resort. The more industrial southwestern end of town broke away to form the town of Ashland. The movie On Golden Pond was filmed here. 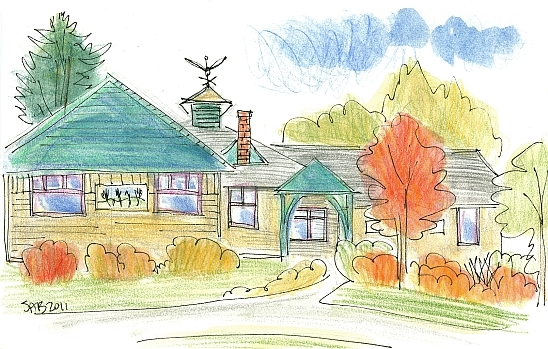 As well, the town is known for its Squam Lake Natural Science Center, and the Holderness School. a co-ed college preparatory boarding school. The edge of a church graveyard in Tuftonboro, New Hampshire provides a panoramic view of Lake Winnipesaukee. This largest lake in the state covers 71 square miles (184 km2). In the summer time the many small boats zipping around resemble water bugs. And see the biplane? 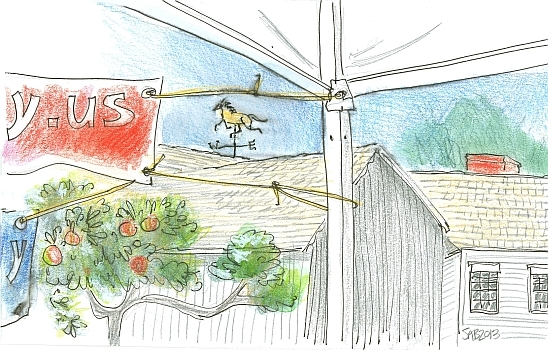 On the last day of the market this summer, I saw my chance to draw the ‘Climbing Tree’. The birch tree on the New London town green is often full of little children attracted to the low branches. 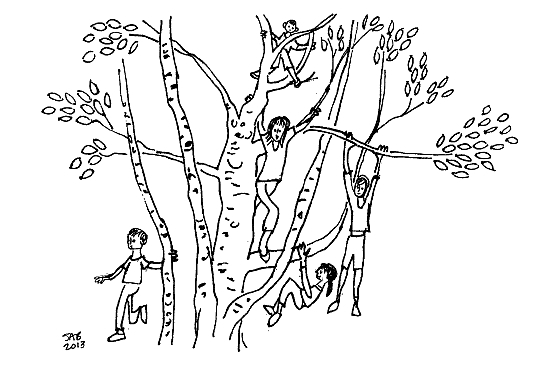 When I was a child, way back in the 1950s, kids spent a lot of time climbing their local, favorite trees. My special tree was an oak. I could see the world from up high, but no one saw me. This tree inspires a more communal event. Last weekend on Saturday we drove two towns west to Newport, NH. This year was their 40th annual Apple Pie Fair. An early harvest fair of sorts. The red striped tent held the home made apple pies for sale. They were sold out by the time we got there, though we did manage to get a piece of apple crumble (à la mode) at another tent. The town green is flat, rectangular, and grassy. 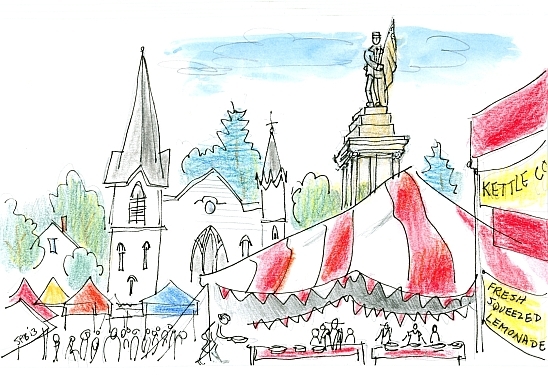 There’s a art/craft/farmer’s market there every week in the summer, and it’s also a place for wintertime fun as seen in this drawing from an earlier blog. The Civil War statue in the center of the green is unusually tall and ornate. It was erected in 1912, about forty years after the end of the terrible conflict. And two years before the next. The white painted church at the far end was originally brown shingled as was once very fashionable. Actually the style is returning to favor. 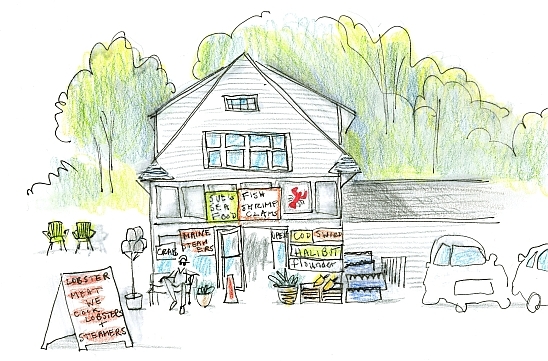 Sue’s Sea Food is located in Kittery, Maine, just across the Piscataqua River from New Hampshire. We usually buy lunch there, lobster rolls always, when we are in the area. The roof line looks odd if you have never seen this type of building before. The two side wings on the roof are called dormers, meant to provide extra room and sunlight to the bedrooms. Sue’s bearded husband sits on the bench. I was asked as a special favor to draw the Lion’s Club popcorn cart in Goffstown, NH. (The Lion’s Club is one of many nationwide service organizations, largely composed of business people in the town.) The cart was built in 1930. 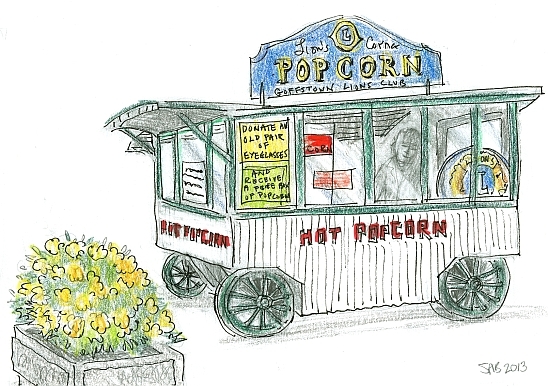 Think about this...a popcorn cart built the year after the stock market crashed. Perhaps it was built to bring some small inexpensive cheer to all. And to raise money too? And it was moved from place to place too. My family always stopped for popcorn from either this cart or its twin in Manchester, NH during our long car trips from Massachusetts. We were headed north to see our grandparents in Concord, and there weren’t any superhighways back then. And we needed a treat along the way. The cart I recall was gas fired and made a wonderful crackly sound. We knew we were close by the scent alone. A gardener in Goffstown has a sense of humor. The yellow marigold flowers growing out of the stone trough are round and puffy and shaped like popcorn. 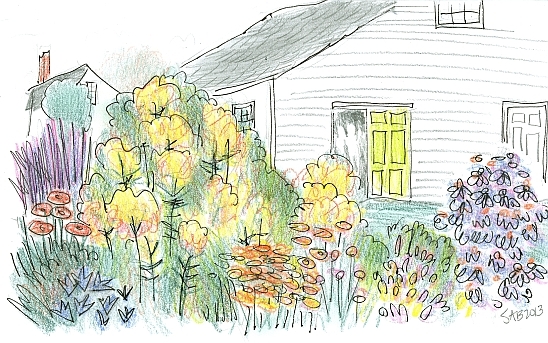 I sat on the soft grass to draw the flowers in the cutting garden of the New London Historical Society in our town. They are tended by several members and are used for floral arrangements when needed. We were seated under our vendor’s tent at the recent Artisan’s Weekend at our town’s Historical Society. The crowds were thin, and I had plenty of time to gaze around and sketch. I saw the copper weathervane neatly framed in the rigging of our tent signs. 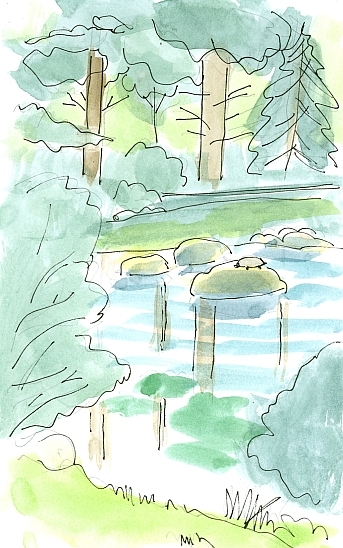 This little pond is close by to our house, and we pass it daily. When the sun is out, one little turtle sits on the rock. I always look to the right to see if he/she is there. 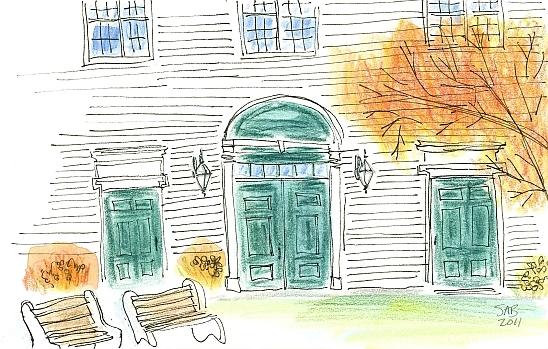 These are the front doors of the Deering, NH Town Hall, erected in 1788. From 1788 to 1829 the building was used as a meeting house for both civic and religious groups. In 1819, New Hampshire passed the Toleration Act which required the separation of church and state. Which meant that the Congregational Church members were required to build their own building. Completed in 1830, the church sits across the road. The autumn colors here in New England are world famous. Do not visit these parts if you do not love red, orange, and yellow against white wooden frame buildings and blindingly blue skies. Sharon, NH has a small population of under 500. It was once a part of the nearby larger town of Peterborough. On the town seal is a brick one room schoolhouse, which has been in continuous use since it was built in 1832. Besides the education of the town’s children, the small building has been used by church groups. Currently, town officials meet there. 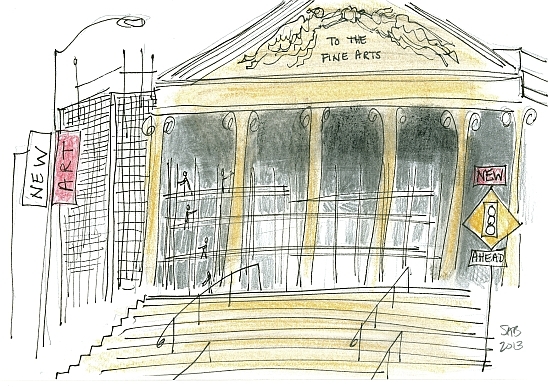 I drew the contemporary Sharon Arts Center educational building. (There is another Sharon Arts Center location in Peterborough that is a sales and exhibition space.) A multitude of arts and crafts classes are available here. Rochester, NH, with nearly 30,000 residents (2010 census) is a dignified place with brick mills, parks, a circular one way traffic system and a splendid combination building of town hall and opera house. First a few words about the mills. The Cochecho River provided the water power for the gristmills, sawmills, tanneries, and textile mills. Woolen blankets woven here won the first place award at the 1853 New York World’s Fair. Shoes were made here for over seventy years. And quality bricks from Rochester are still holding up the newer buildings of Harvard. New Hampshire has at least ten opera houses, built in mill towns for the express purpose of entertainment and enlightenment of the mill workers. Attendance was required. 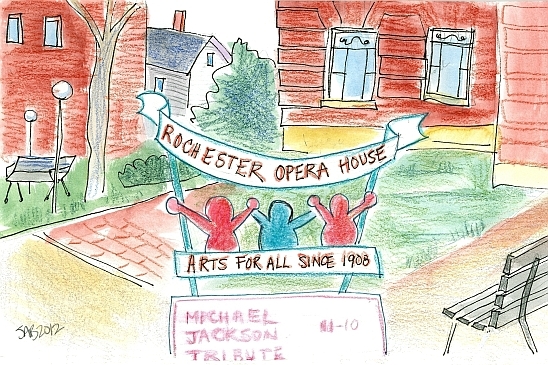 The Rochester Opera House was designed by George Gilman Adams in 1908, who specialized in dual purpose town hall/opera concepts. He built at least eight all around New England. Four of his opera houses still exist today, filling multiple purposes within their communities. What makes this building special is the floor. Mr. Adams designed an audience floor which can be raised or lowered by a complicated mechanism of cranks, levers, pulleys, and leather belts. It is the only one of its kind in the United States. For a concert or a play, the floor is raised into a tiered angle. For a dance or banquet occasion, the floor is of course flat and level. The opera house, including the floor, has been recently restored. It has a most ambitious calendar of scheduled events. 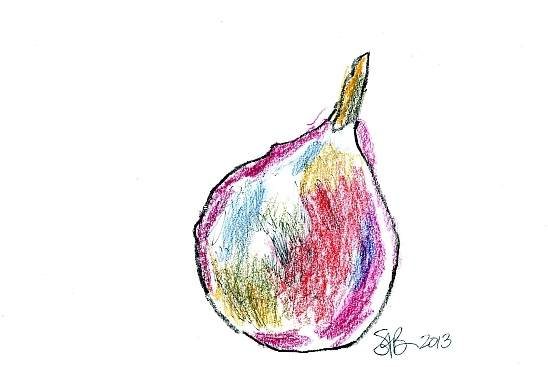 I quickly sketched this red pear as a demonstration in my drawing class this summer. This is one of those ‘the more you look, the more you see’ moments. The shiny red skin was comprised of multitude of shades of many colors.